I’ve got the citrus itch. Only way to scratch it is with grapefruit and tequila. Maybe some lime and salt. Kind of sounds like a margarita? It’s not! It almost is. But there are bubbles. Seltzery, soda-y bubbles. And homemade syrup of the citrusy variety. I’ve been trying not to drink it (… the syrup) all week. Grapefruit, lime, bubbles and tequila are a thing and come together in a beautiful shade of pink to make these short days happier. Well, and probably shorter. But that’s okay. It all starts with salty sugar. Is that a real life concoction? It is now because I’m making it one. I mixed… salt and sugar. To get salty sugar. But! I also added some chipotle chili powder. A touch of heat. It will blow your mind. And maybe chap your lips, so grab some Burt’s Bees and let’s do this. I could take a spoon to an entire grapefruit (or three) and be thrilled as pie. Is that a taste buds thing? An acquired taste thing? A similar thing to my love for all things briney, vinegary and pickled? I’ve always loved it so maybe I was born with it. And noooo I don’t want to count how many times I’ve used the word “thing” in this post. Just let me cover my eyes and run away. This is ridiculously light and refreshing. It’s just FRESH, a la Kristen Wiig in Bridesmaids when she enters Helen’s compound for the bridal shower. If you even knew how many times a week I use the line “ah that’s fresh” you would disown me as an invisible internet friend. Even worse is the amount of times I want to use it but don’t. The good news is that BECAUSE it’s so fresh and light, it should fit into your January resolution plan (does it look like this?) without much fright. The bad news is that it’s still January. Good TV hasn’t even started yet! Are you dying? I’m dying. Tell me: were you a diehard thirsty Thursday partier in college (and maybe beyond)? While I ALWAYS believed that the weekend started on Thursday (and still do, oops), I was more of a let’s-eat-some-oreos-while-cuddled-in-bed-and-watch-Grey’s thirsty Thursday-er. Snoozefest. This is why I’m elderly. Oh oh! Grapefruit is pretty good for us, right? Right. Let’s just consider this our morning juice… but around 5PM. I’ll justify it for you so don’t even worry. 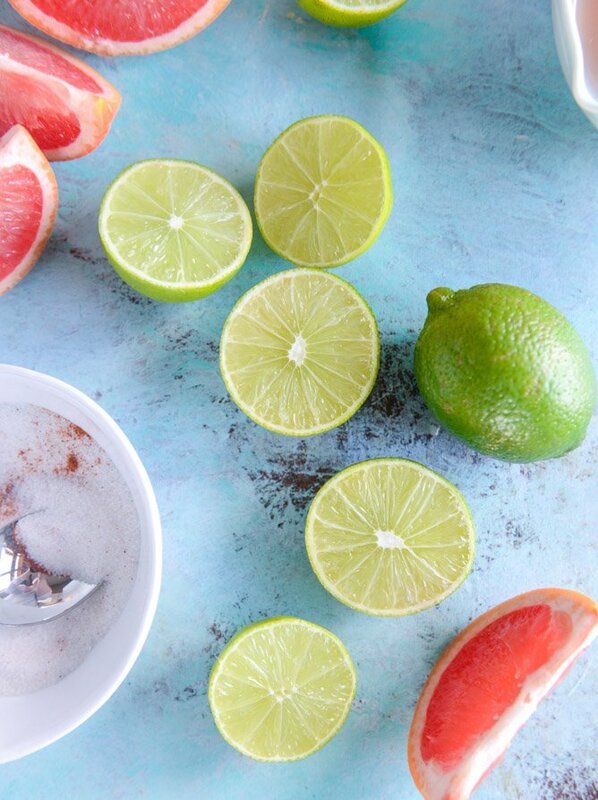 Rim your glass with a lime or grapefruit wedge and dip in the salty sugar mixture to coat. Fill the glass halfway with crushed ice. Add the grapefruit juice, tequila, lime juice and syrup, stirring well with a mixer or long spoon. Pour the soda over top and garnish with a lime or grapefruit wedge. Serve! Heat the grapefruit juice, lime juice, water and sugar in a saucepan over medium heat. Whisk until the sugar dissolves and bring the mixture to a boil. Turn off the heat and let it cool to room temperature. It will become slightly syrupy. This stays great in the fridge for a few days. After a few days of a sick kid, I will take 2. Pretttty sure I’ve pinned everything you’ve put up this week. You are on fire, lady! Pumped for palomas! seriously, thank you! that’s so kind. means a ton. My god these look amazing. It’s been a rough week so I will be needing these this weekend! Loving that salty sugar! These look perfect! Can’t wait to try. And I’m right there with you – obsessed with grapefruit and all thinks vinegary. Glad to know I’m not alone. I’ve pinned like 10 recipes for palomas, maybe I’ll finally make a batch! They sound fantastic right now! Now this look so yummy! These look so good, they would be perfect for when the warmer weather hits. This cocktail sounds amazing but these pictures are SO. GORGEOUS. I just want to frame one and hang it in my kitchen. AAAHHHH how I LOVE YOU!!!! I think we should start a People Who ADORE Grapefruit Club because whenever I’m eating one I always get this look like dafuq is wrong with you!??! I seriously can’t wait to make this. Grapefruit + Tequila = the. best. Jessicaaaaaaa these are insanely gorgeous!! I’m a sucker for grapefruit in my adult bev, and the spicy salt sounds like true love. <3 Get it, girl! What is this background you are using? I’m in love with the color!!!! The drinks look amazing too! i think it’s one of their graffiti backgrounds?? i’ve used it before but it can look really different in different lights! First, those pictures are stunning and oh my, I want to make these RIGHT NOW. But I’m at work and I can’t blow off a conference call with the “I need to run out and buy ingredients to make a delicious cocktail right now” excuse, could I? I totally cracked up at the “Ah, that’s fresh” comment…I use that too – but no one seems to get the reference. It’s fitting in so many situations, right? These look amazing…making them soon! Thank you! As delicious as these look, I must be allergic to tequila, I become REALLY nasty when I even taste it. Anything non tequila? For those of us who love to imbibe? Oh, and try Stoli Salted Karamel vodka.. It has a marvellous buttery finish in the throat, so good! Kisses and hugs to that gorgeous young man! jann, i think you could totally replace the tequila here with vodka! Yummmmm. We just made these! Delish. We tried it without the salty sugar first, and it was good, but a little lacking. The salty chili sugar adds an awesome flavor oomph! glad you like them nikki! These were so good. Thanks! Oh yes, we CAN consider this a juice, so that means we can have it for brekkie? Yesss!? Right? I’m not a fan of Margaritas, but I’m convinced, this is not that. So, it’s on the list. The citrus is making me drool and the color is lovely!! Gorgeous my dear! Pinned everywhere I can pin it… (!!) Thank you for this my dear!! not a fan of margaritas?!? i’m dead. I love Margaritas and I absolutely adore tequila. But grapefruit with lime and tequila? Never even thought of mixing those three. Sounds just lovely! I have a bunch of cocktail recipes that I use when I invite my girlfriends over and this is a great addition to it! Thank you for the idea and the tips! I made him one with vodka and one for me with gin. Much better with the tequilla. Salty chili sugar?! Say no more–I’m in! That sounds so good!